Menstrual Regulation (MR) has been part of Bangladesh’s national family planning programsince 1979. 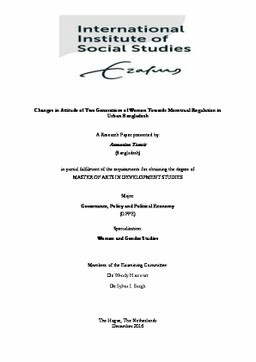 This research explores the changes in attitudes towards MR between two different generations of women in urban Bangladesh belonging to different socioeconomic class, marital status and religious identity. By focusing on women's narratives, this research provides an evidence based critical understanding of urban Bangladeshi women's subjectivities and their experience in negotiating services as they navigate the difficulties around having to undertake MR. This study contributes to the discussion on gender equality in relation to SRHR as being an empowering, not population control discourse. It also stresses on the importance of ensuring that information about MR is made available widely as a legal procedure that would gradually contribute to eliminating social stigma. What the respondent’s stories show is that it is important to tackle societal stigma towards MR/abortion, in order for Bangladesh to move forward in its aims to achieve gender equality.